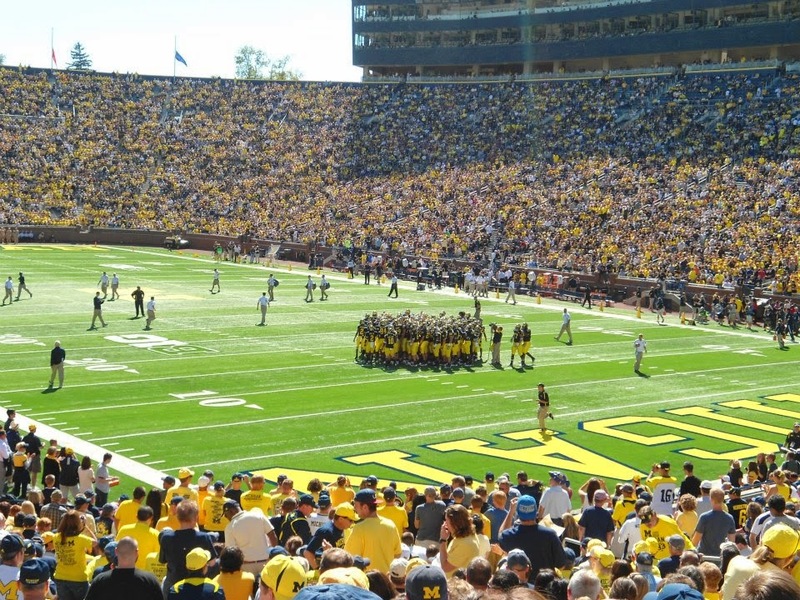 Which 2015 target visited Michigan this past weekend? Will a certain TE target be committing soon? The Rivals Camp Series visited Detroit and Columbus last weekend. Which Michigan targets/commits had a big weekend? Find out in this Tuesdays version of The Future Huddle. 2015 TE Chris Clark named Michigan his outright leader this past weekend. The 4 star tight end has offers from schools such as; Michigan State, Notre Dame, Ohio State, and Georgia. Clark announced on twitter Monday night that he would be committing soon. Chris spoke with Steve Wiltfong from 24/7 a couple days ago to discuss his visits, and he had something to say that should make Wolverine fans happy. "I met some great people at both schools. I think the Michigan one went better than the Ohio State one to be honest. I felt a little more comfortable with the players at Michigan. Both Coach Hoke and Coach Meyer have a good idea of what they want to do at the tight end position. I think I would say that Michigan is the favorite right now though." The last couple of months have been a whirlwind for Chris’s recruitment. He committed to North Carolina in the middle of March, only to decommit a couple weeks later. Since then he’s visited Notre Dame, Michigan and Ohio State. Chris has been vocal on twitter about the visits he has taken, and it seems as if some fans are not too happy about him enjoying himself while on visits to other schools; which makes me feel that this is why he is moving his commitment date closer. Darian will release his top 5 schools in the next couple weeks and I fully expect Michigan to make the cut. Monday, Darian got his invite to the Semper Fidelis All American Bowl game that takes place this upcoming January. The Rivals Camp Series continued last weekend with stops in Detroit and Columbus. Three Michigan targets and one current commit took home some hardware for their trophy cases at home. 2015 Cass Tech RB Mike Weber won Running Back MVP. 2016 LB Target Daelin Hayes won the LB MVP award. 2015 QB Alex Malzone won the Quarterback MVP award. Speaking of Alex Malzone; he threw for the Michigan coaching staff on Monday morning. First reports sound as if it went very well. Malzone ranks as the #15 Pro Style QB in the 2015 class according to 24/7 composite rankings. With no QBs committed as of yet for the 2015 recruiting cycle, Michigan needs to find their QB for the future, and fast. I’m surprised a scholarship wasn’t offered afterwards, but one should come out this week. Malzone will also visit Ann Arbor within the next two weeks. Alex's highlight tape can be seen below. Current 2015 4 Star commit Tyree Kinnel won Defensive Back MVP in the Rivals Camp Series in Columbus this weekend. Afterwards, Kinnel was invited to the Rivals100 Five-Star Challenge later this summer. Also, Tyree has a very good chance of earning his 5th star with his performance last weekend. 2015 DE Target Jashon Cornell has Michigan State as his #1 school as of right now per Tom VanHaaren. 2015 5 Star DE Keisean Lucier-South told Adam Gorney from Rivals that he will take an official visit to both Michigan and Notre Dame this upcoming fall. While speaking with Adam, Lucier-South spoke about Michigan and his plans to visit. "I hope the official is not my only visit to Michigan," he said. "I'm really trying to get out there sometime this summer still and I'm hoping something can get figured out." Lucier-South seems to be high on Michigan and I think it will come down to them or UCLA for his services. The Future Huddle- Offer Time!